Downloadable instructions for modular buildings, such as the modified Haunted House and White Picket Fences, can be found here, while instructions for Friends buildings and modulars, such as Emma’s Place, are found here. Everything else is on this page below. The theme for BrickWorld Chicago 2017 is “Lights, Camera, Action” and was the inspiration for this build. This MOC of a TV studio camera and lighting truss was my (unsuccessful) entry for the event kit contest for the convention. NikSput Starfighter is an alternative build, using all but four parts of Mixels Series 4 NikSput (41528), and was the result of a challenge posed by EuroBricks member Rolli (Markus). Download the PDF instructions: NikSputStarfighter-Instructions. The Bedside and Benchtop is a small vignette designed by Pete Strege (RedCoKid). “Bedside and Benchtop” is another name for “translational” biology, or the approach of adapting knowledge of experiments in the lab to assist patients in the clinic. Download the PDF instructions: RCK10a-BedBenchtop-Instructions. My dream home in micro scale. It’s a minimalist home, perched somewhere on the side of a mountain or top of a cliff, with uninterrupted views of the ocean. Download the PDF instructions: 053-OceanVistas-Instructions. Alternatively, you can access the *.ldr file from BrickSafe. Stumpy is an alternative build using pieces from Wolverine’s Chopper Showdown (6866). He (?) was built for the MOC Alternative Build Competition over on Rebrickable. Download the PDF instructions: 047-Stumpy-Instructions. This cute Butterfly Camper was built for the Eurobricks “Pimp my Camper” contest, and is based on TLG’s Mini VW Camper (40079). It now resides permanently on the roof of Emma’s Place. Download the PDF instructions: Butterfly Camper Instructions. A little something for the Christmas tree. 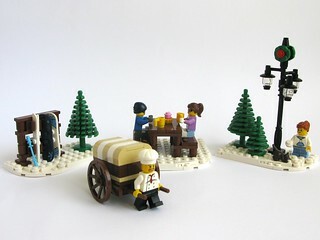 My Winter Cafe, an MOC originally built in January 2013, included a cart, ski rack, bench table and lamp post as sub-models. The cart was used by the local bakery for delivering cup cakes to the Winter Cafe. Download the PDF instructions for the cart: Hand Cart Instructions. Download the PDF instructions for these other subsets: 039-Cafe-Accessories-Instructions.